orari di apertura: dalle 10:00 alle 12:30 – dalle 16:00 alle 18:00 da lunedì a sabato. After the success of the previous edition of Bibliomosaico, hosted in Paray-le-Monial (France) July 2010, in Chartres (France) October 2012, in Riga (Latvia) June 2014, in Obernai (France) August 2015, the review of the artist's books back in the same place and with the same characteristics but with new works. The exhibition Bibliomosaico was conceived by Rosetta Berardi in 2009 during the International Festival of Contemporary Mosaic RavennaMosaico; a thematic exhibition originated with the intention of stimulating mosaicists to think about the shape of a book meant to be the representation of a “book object”. That is the creation of a book which creates a desire to look at it but not to read it, a kind of “not a book”, a “book object”, a book which, although it has lost its content of words, has gained its own specific conceptual meaning of an open work with which the artist can create new forms. So it is not a question of a book that becomes a work of art but rather a work of art that suggests a book. 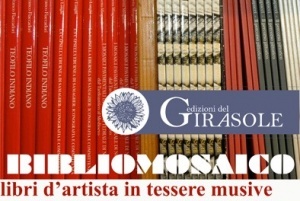 The works, made for the space they occupy the Edizioni del Girasole, will be exhibited between paper books in fact.